On Monday, Facebook announced that they were introducing a new messaging platform. You can read all about it on a blog post here. Facebook is careful to point out that this is not a replacement for email; it is not email, so they claim. So what is it? This messaging platform is basically a way to talk to people outside of Facebook from Facebook. You use the Facebook interface to talk to your friends. If your friends are on SMS (i.e., text via cell phone), the communication exchange will be sent to the Facebook chat window (or possibly the messaging window, it is unclear what the messaging interface is). If your friend is using a chat platform, then the message is routed through the Facebook chat window into their chat program (in theory). Similarly, if all they use is email, then you can have a conversation from you to them. You are given a you@facebook.com email address. You send your friend the message, and they reply back to you. The message then goes to your Facebook messages view where you can read the message. In this case, the email address you are given is an SMTP address that the mail is delivered to, and then the Facebook messaging API parses the message and renders it for you in your own window. Essentially, independent of the platform, you can still use the feature. It's kind of like everything Java promised in the 1990's — it runs on Windows, the Mac or Unix. LONDON: Mark Zuckerberg , founder of social networking giant Facebook, has said that email would fade out, just like the letter did, as it is slow and informal. The 26-year-old made the claim as he launched the Facebook's new messaging service, which integrates all web and text-based communications and works instantaneously. The service, perceived as a direct rival to Google's Gmail, marks a new front in the ongoing and increasingly bitter battle between Facebook and Google to gain the loyalty of users… Facebook's new email system is modeled on instant messaging and on-line chat and will allow people to simplify their communications regardless of how they choose to do it. 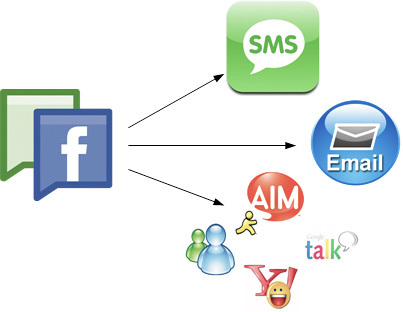 Texts, email or instant messages will all come into one 'feed' and users can respond in any way they want. Zuckerberg said that he was changing Facebook because young people found email was too much of a 'cognitive load'. Zuckerberg then went on to say that if in the future, Facebook's system fundamentally alters the way people communicate and email is depreciated over time, that would be okay too. He said that in talking to current high schoolers (who make him feel "really old") they don't use email. "It's too formal," Zuckerberg noted. Again, if you extrapolate that out, that means the end of email. It sounds as if Zuckerberg is just tip-toeing around calling for the death of a system that a lot of people currently use. Java was supposed to be a ubiquitous tool that would soon be everywhere. And while Java is popular today, by no means is it everywhere and anywhere (readers, feel free to speculate why this is in the Comments if you so desire). This tool, too, promises to be a replacement for the existing platform, kind of a lot like Google Wave did. Zuckerberg is correct in his speculation that young people do not rely on email the way that the older generation does. As they begin to rely more and more on instantaneous communication, they will bring their biases with them as they get older and enter the workforce. They will then start a gradual shift away from email — a technology that they don't use very much — in favor of one that they use quite frequently. Ultimately, this signals that email will eventually go the way of the telgraph… or more likely the fax. Where I think Zuckerberg's assumption breaks down is the fact that this new platform is modeled on instant messaging. Communication is synchronous. I am redefining the use of the term to suit my own purposes; in this context what I mean is that one person talks, the other responds instantaneously, and repeat. It's just like a telephone conversation. It requires the other person to be there. One of the strengths of email that instant messaging lacks is asynchronous communication. With email, you send someone a message and they may or may not respond right away. Sending somebody an email means that you are not necessarily expecting an instantaneous reply. In fact, that's the whole point of not using the phone or instant messaging. You are not expecting your target recipient to be at your beck and call. Furthermore, we do not use email today only to transmit short conversations. We use it to send and receive documents via the use of attachments, to have multi threaded conversations, and to use as a searchable data store. Furthermore, more advanced communication platforms like Outlook and Exchange use email clients as an organization and calendaring tool. I can schedule meetings by looking at other people's calendars and find time on their timeslot. I can use it to see if someone is free or in a meeting, and if I like I can respond with instant messaging. In other words, email is used for far more than just instant chat, we use it for richer forms of communication that can be scheduled in advance or handled offline. While there is no doubt that it's possible that the new Facebook platform will be useful for quick chats, it will have to do a lot more than that in order to replace email's functionality. Where I think the strength of this feature lies is in its enablement of communication amongst different platforms. I love IM clients that let me talk to my contacts on Google Talk, Live Messenger or Yahoo Messenger (the fact that Google Wave was restricted to Gmail users was one of its weaknesses, imo). A communications platform that interoperates with email, chat, IM and SMS is very powerful… potentially. Young people may bring this concept to the work place but I am not convinced that they will be satisfied with a feature that has narrow applicability in real life. Local Time: Friday, April 19, 2019 11:44 PM PDT – Page Load: 0.3551 Sec.